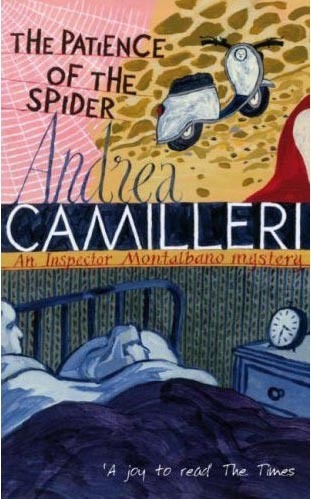 THE PATIENCE OF THE SPIDER is not the best Montalbano by quite a long shot. However, that is saying little, as it's still a hugely entertaining, amusing read. Montalbano himself is on fine crotchety, manipulative, intuitively brilliant form. The writing is as funny and lightly sarcastic as ever. However, the plot here has a lot less meat on its bones than previous outings. Indeed, there's little more to the book than the simple synopsis presented above. It's direct and focused, but it feels thin and underdeveloped. And not only that, but it's quite obvious what's going on from about halfway through the book, and the reader is rather surprised that Montalbano doesn't cotton on to what's going on immediately. It's enjoyable, yes, but would be served well by being a bit more complex. That said, however, it says a lot about the qualities of Camilleri's hugely enjoyable writing style (it's full of sly fun and reads immensely quickly - possibly thanks to the simplicity of the plot!) that the book is still 100% worth reading. Even with the mystery so easy to puzzle out (and Camilleri himself seems to subconsciously agree on this point, giving as he does only two pages to solve it in), the book is still a fun treat to read. I recommend it, as I do all his books, but it's not the most well-rounded of the series, and certainly is a pale sister compared to the brilliance of last year's ROUNDING THE MARK.